Experience workstation-class performance in the iMac form factor with the space gray Apple 27" iMac Pro with Retina 5K Display (Early 2019). To handle even more demanding tasks, these models are equipped with 256GB of 2666 MHz DDR4 ECC memory, which is the maximum amount supported. Featuring a 3.2 GHz Intel Xeon W 8-Core processor, the iMac Pro is designed to handle intensive professional workflows, such as photo, video, 3D animation, music, science, and software development. The iMac Pro also has a 1TB PCIe SSD, which has a 3.3 GB/s write speed and a 2.8 GB/s read speed, for loading huge files and launching apps faster. In addition to a workstation-class processor, the iMac Pro also provides workstation-class graphics, thanks to the dedicated AMD Radeon Pro Vega 64 graphics card. With 16GB of HBM2 (High-Bandwidth Memory) VRAM and up to a 512 GB/s memory bandwidth, the Radeon Pro Vega 64 GPU delivers up to 11 teraflops of single precision and up to 22 teraflops of half precision. Still just 5mm at its edge, the iMac Pro features a 27" Retina 5K display with a 5120 x 2880 resolution and a 16:9 aspect ratio. With up to 500 nits of brightness, a P3 wide color gamut, and support for one billion colors with 10-bit spatial and temporal dithering, the Retina 5K display delivers a vivid, true-to-life viewing experience. If you want to create a multi-monitor setup, up to two additional 5K (5120 x 2880) displays are supported, or opt for four UHD 4K (3480 x 2160) displays. Both of these options support refresh rates of 60 Hz and 1 billion colors. Also supported are four 4K (4096 x 2304) displays with refresh rates of 60 Hz and millions of colors. The iMac Pro features a 10Gb Ethernet port, which is up to 10 times faster than the 10/100/1000 Mbps Gigabit Ethernet port found on the previous generation iMacs. The 10Gb Ethernet port also supports Nbase-T industry-standard 1Gb, 2.5Gb, and 5Gb link speeds. If you would rather go wireless, you can utilize dual-band Wi-Fi 5 (802.11ac). The iMac Pro also has Bluetooth 4.2 technology, as well as an SDXC media card slot, four 40 Gb/s Thunderbolt 3 ports, four USB 3.0 Type-A ports, a FaceTime Full HD 1080p webcam, stereo speakers, and four mics. There is also the Apple T2 chip for enhanced integration and security. Included with the iMac Pro is the matching space gray Apple Magic Keyboard with numeric keypad, the space gray Apple Magic Mouse 2, and a power cord. A Lightning to USB Type-A cable is also included so you can charge your peripherals. Protection is provided by 90 days of complimentary technical support and a limited 1-year warranty, which can be extended by purchasing AppleCare+ for Mac. Pros love iMac. So Apple created one just for you. It's packed with the powerful graphics and processors, along with advanced storage, memory, and I/O - all behind a Retina 5K display in a sleek, all-in-one design. For everyone from photographers to video editors to 3D animators to musicians to software developers to scientists, iMac Pro is ready to turn your biggest ideas into your greatest work. An iMac with 4 cores is remarkable enough. But an iMac with 8 cores is an entirely different creature. Add Turbo Boost speeds up to 4.2 GHz, and the iMac Pro has the power and flexibility to balance multi-core processing with single-thread performance. With AVX-512 vector instructions and a cache architecture, the processor handles even more data even more quickly, which means you can render images, edit up to 8K video, manipulate photos, create real-time audio effects, or compile your next app - all at lightning speed. Billowing smoke. Torrential rain. A wheat field in the wind. With up to 8 cores and Hyper-Threading, the iMac Pro lets you build and render particle systems of all kinds - static or animated, 2D or 3D. Featuring AMD Radeon Pro Vega 64 graphics, the iMac Pro delivers workstation-class graphics. This model has 16GB of High Bandwidth Memory, which helps deliver a jump in performance and is up to three times faster than the GPU in the Mac Pro. This translates to higher frame rates, real-time 3D rendering, more lifelike special effects, and gameplay at max settings. It also supports both single- and half-precision computing, so operations that don't require a full 32 bits of precision can be performed twice as fast. How fast? Up to 22 teraflops fast. With four channels of memory, the iMac Pro can now accommodate up to 256GB. So you can visualize, simulate, and render huge 3D models, create multiple test environments for cross-platform development, and keep numerous apps open at the same time. It's all powerful, for all the things you want to do. Up to 1TB of all-flash storage lets you work on large 4K and HD projects, regardless of the codec. And with up to 3.3 GB/s of write performance and 2.8 GB/s of read performance, loading huge files and launching apps is fast. Every iMac Pro is equipped with the Apple T2 Security Chip, Apple's second-generation custom Mac silicon. By redesigning and integrating several controllers found in other Mac systems - like the system management controller, image signal processor, audio controller, and SSD controller - the T2 Security Chip delivers robust capabilities to the Mac. For instance, the image signal processor works with the FaceTime HD camera to enable enhanced tone mapping, improved exposure control, and face detection-based auto exposure and auto white balance. The T2 also makes iMac Pro even more secure, thanks to a Secure Enclave coprocessor that provides the foundation for encrypted storage and secure boot capabilities. The data on your SSD is encrypted using dedicated AES hardware with no effect on the SSD's performance, while keeping the Intel Xeon processor free for your compute tasks. And secure boot helps ensure that the lowest levels of software aren't tampered with and that only operating system software trusted by Apple loads at startup. The Apple T2 Security Chip also brings a familiar voice to iMac Pro - Hey Siri is always ready to heed your call. There are plenty of high-speed ports to create a high-performance workstation. Four Thunderbolt 3 ports let you connect two 5K monitors via the DisplayPort protocol - for 44 million pixels total - and transfer data at up to 40 Gb/s. Thunderbolt 3 also supported 10 Gb/s USB 3.1. And there's something you probably didn't expect in an iMac: 10Gb Ethernet. So, sharing files between desktops, or working with high-performance network storage, is up to 10 times faster. 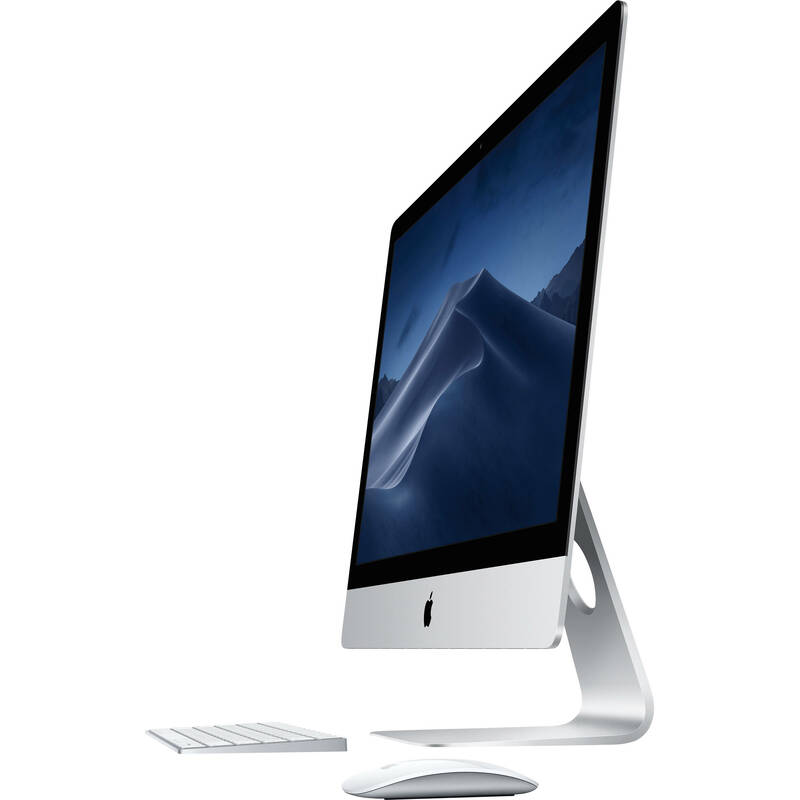 It almost goes without saying: If it's an iMac, it will have a gorgeous display. And iMac Pro doesn't disappoint. In fact, its 27" screen features 500 nits of brightness across its 14.7 million pixels. It's as if the sleek, all-in-one design disappears behind the stunning screen, so you can focus on your content. Along with P3 color and support for a billion colors, the iMac Pro delivers vivid, true-to-life images with smooth gradients and greatly reduced banding. The iMac Pro puts the power of a workstation behind a Retina 5K display, in a sleek enclosure just 5mm wide at its edge. With your whole system powered by a single cable, your workspace stays free of clutter. Packing all that performance into such a slim all-in-one design required a unique approach to cooling the system. Apple redesigned the thermal architecture of the iMac Pro with dual blowers, a high-capacity heatsink, and extra venting. The result? Almost 75% more airflow and an 80% increase in system thermal capacity, which lets the iMac Pro handle 500W, or 67% more power than the 27" iMac. The enhanced stereo speakers in the iMac Pro deliver broad frequency response, rich bass, and impressive volume. So, you'll be able to hear that crashing cymbal, multilayered effect, or sample-based sound, all with high fidelity. And with four beamforming mics, your voice is heard loud and clear over most background noise. You even get space gray accessories to match your iMac Pro - all wireless and rechargeable. The Magic Keyboard includes a numeric keypad, and the Magic Mouse 2 is also included.